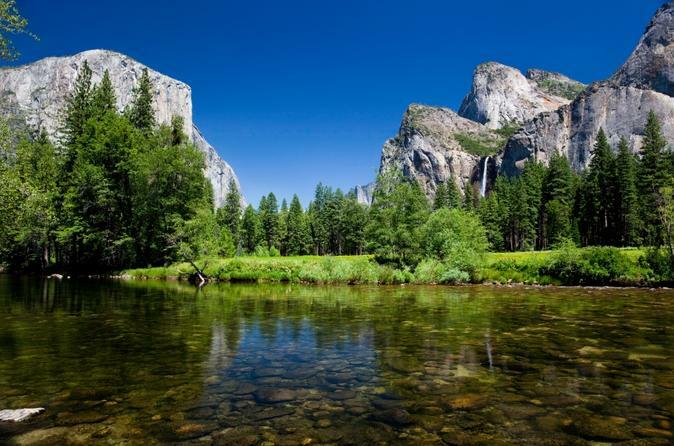 Eco friendly comprehensive Yosemite Introduction - 5 hours free to explore Yosemite Valley. This self guided trip is ideal if you are independent and like the freedom. We provide valley shuttle and sightseeing map, detailed information and contact phone number if you need help on the trip. Relaxed travel on comfortable AMTRAK train through Delta area to Merced and then full size bus to Yosemite Valley. You see Merced River, Bridalveil Fall, El Capitan, Cathedral Rocks, Sentinel Rock and Yosemite Falls. Past Yosemite Chapel crossing the Sentinel Bridge you see the iconic Half Dome. At the Village Visitor Center see Ansel Adams Gallery, Yosemite Theater and American Native village of The Ahwahneeche. Shuttle service takes you east towards Half Dome Village, Happy Isles and Mirror Lake or west towards Yosemite Falls and Yosemite Valley Lodge. No strenuous hiking. Take a short walk, about thirty minutes from Visitor Center to Yosemite Falls and Valley Lodge or take the free shuttle. At 6:45 a.m. check in at Amtrak Transbay Terminal. Thruway bus takes you across Bay Bridge. See Delta towns going through Stockton, Modesto and agricultural San Joaquin Valley. 3 hours on the train with large windows, WIFI outlets, rest rooms and Cafe Car . Short break at the train station. 2 hours to Yosemite on full size bus with restroom. Driving through Gold Country and Mariposa enter Yosemite at Arch Rock Entrance around 12:40 p.m. arriving at Yosemite Visitor Center a little after 1:00 p.m. Five hours in Yosemite Valley. Leave at 5:20 p.m. by bus from Yosemite Valley Lodge. Brief break at train station then to Emeryville with transfer to San Francisco arriving 11:30 p.m. Note: Details will be sent with confirmation.